Product prices and availability are accurate as of 2019-04-13 13:46:11 EDT and are subject to change. Any price and availability information displayed on http://www.amazon.com/ at the time of purchase will apply to the purchase of this product. 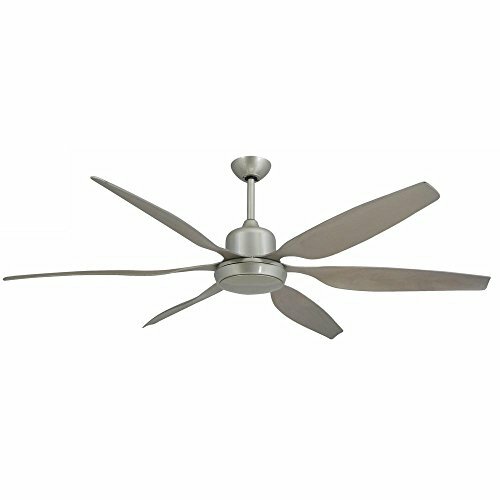 Clean contemporary design with high efficiency DC-motor and 6-blade design that offers an industrial look. Damp rated for indoor or outdoor use, available in brushed nickel. Airflow 9325 CF/M, Energy used 30.8-Watt, Efficiency 303 CFM/W 6-Blade 66-Inch HVLS Design with Super Efficient DC-Motor With Reverse and 6-Speeds Rated for Indoor and Outdoor (Damp Rated) Use Integrated Light That Accepts 2 60-Watt Maximum Medium Base Bulbs Includes Hand Held Remote and Cover for Light if You Do Not Want to Use It.